The Sandman Signature Hotel at St. Andrew Street is really making waves since it opened last year. Aberdeen’s newest hotel, which opened less than six months ago, has already scooped five industry awards, including City Hotel of the Year. 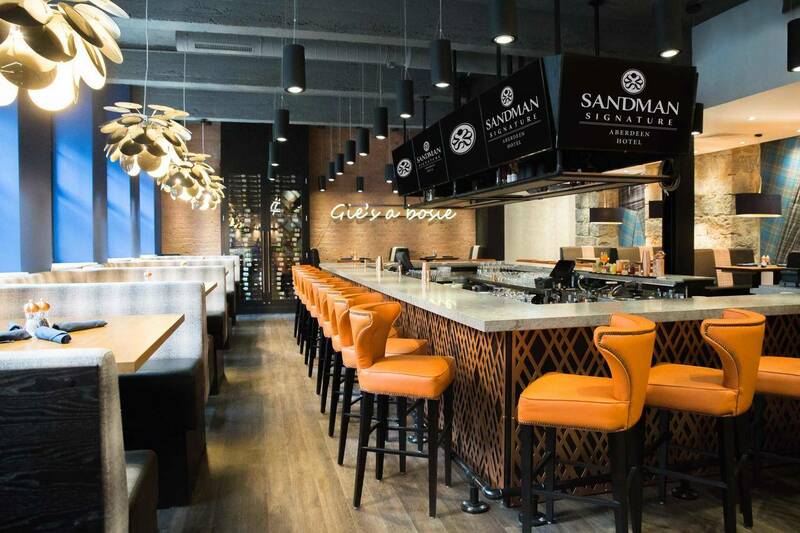 Located in the former Robert Gordon University St. Andrew Street campus, the 218-bedroom hotel is the first Scottish venue in the Canadian Sandman Hotel Group’s portfolio. 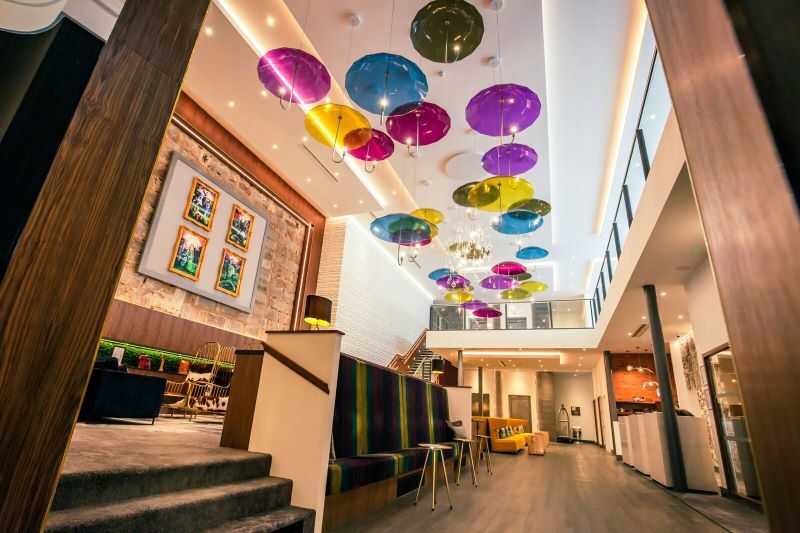 Carefully designed to reflect the creativity and heritage of the city itself, this affordably luxurious hotel combines authentic and traditional Scottish materials with contemporary design. 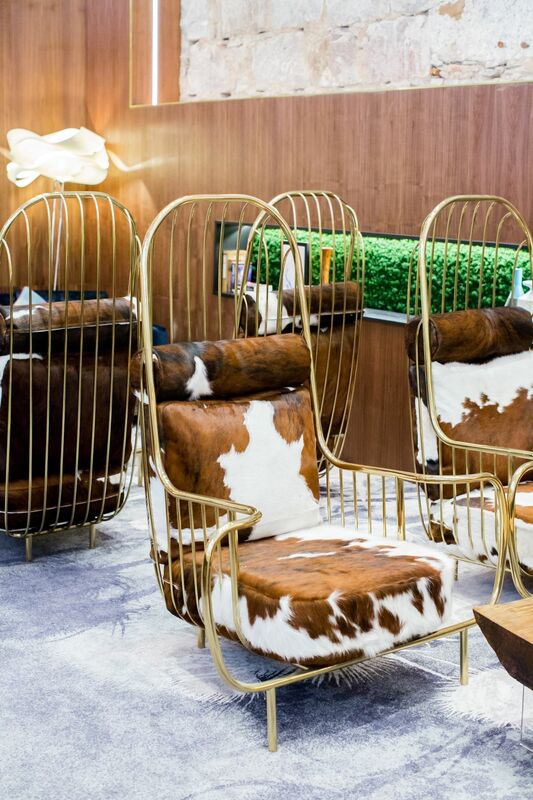 GS Magazine managed to catch up with the hotel’s in-house designer, Lorna Gillespie, to ask how much design has played a part in its new prominence. GS Magazine (GS): What design features are unique to this hotel? Lorna Gillespie (LG): The building itself is fairly unique and definitely a design landmark in Aberdeen’s city centre. We were lucky enough that it also provided us with great opportunities internally. 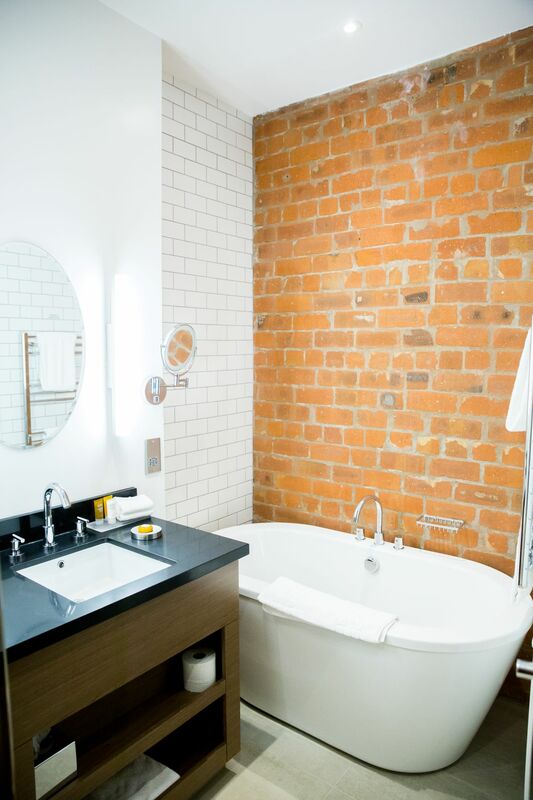 One of my favourite aspects is the exposed brick in the guest bathrooms. We cleaned up the existing bricks and sealed them with a clear, water-repellent finish to create a stunning feature that showcases some of the building’s history, which we hope our guests will love as much as we do. The sheer volume of existing granite we have retained and incorporated into the public spaces also makes the design stand out. 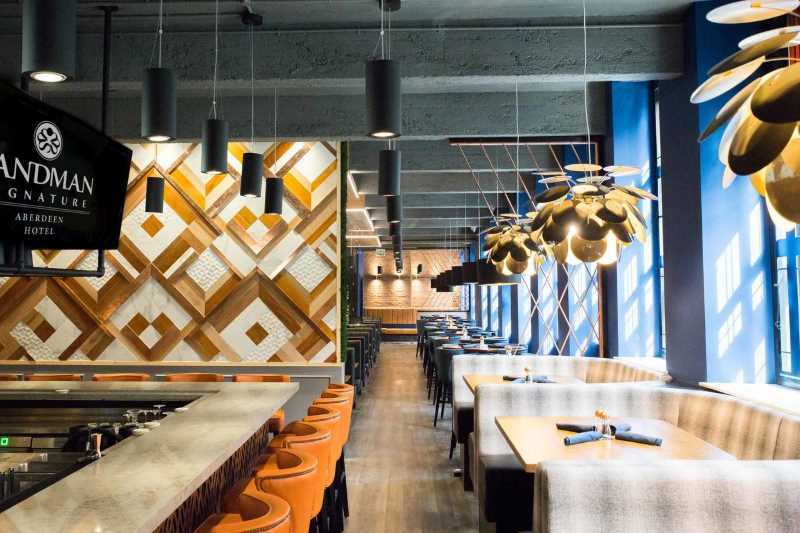 The Chop Grill & Bar, for example, features a full-length granite wall and our whisky lounge, Freedom an’ Whisky, has its bar formed from granite reclaimed from around the building. We really have tried to incorporate the fabric of the building into the interiors, which is a unique way to respond to the interior design brief. GS: How does the design of the hotel reflect the creativity and vibrancy of Aberdeen? LG: In recent years, Aberdeen city centre has benefited greatly from the Nuart scheme, which has brought renewed interest into the local art community. This is only enhanced by the near complete redevelopment of the Aberdeen Art Gallery. At Sandman we wanted to be a part of this exciting time for the city and have partnered up with the Aberdeen Art Gallery to showcase pieces from their collection in our lobby. The pieces change every few months and are a great talking point. GS: What was the brief? LG: The brief was to create a sociable lobby space that guests and visitors alike could enjoy. To provide a space that was Scottish influenced with a contemporary twist and strong links to its setting. A place for friends to gather, an escape from the outside world and a lobby that people want to lounge in. GS: What’s the ethos of the hotel? LG: To provide our guests with an elegant, relaxed and comfortable place to stay. An unhurried transition from the stress and excitement of the day, to the soothing, relaxed atmosphere built into each of our new Sandman Signature Hotels. Considerations such as our Glencraft luxurious mattresses, 24-hour guest services and the latest technology in every room, plus on-site fitness facilities mean our guests soon become repeat visitors as they can feel at home within the hotel. 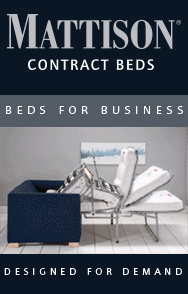 GS: Is there a design style that links this hotel to the other two Sandman hotels in Newcastle and Gatwick? LG: Sandman Signature Hotels do not follow a strict branding design, which allows for creative freedom to design with the location in mind. Each property has design features that tie into the local culture. Becoming part of a community is an important part of the process. GS: How did the umbrella light feature and raindrop pendants come about? LG: We had this huge double height lobby space to fill and knew we needed to make a grand statement. But most importantly we wanted it to be a focal point of the hotel, something that inspired conversation and pulled together a lot of the natural Scottish elements that we had introduced within the lobby. The answer was the weather! Everybody loves to talk about the weather and locals love to hate it, so we decided to use the usually unwelcome sight of an umbrella and turn it into a colourful expression of Scottish humour. 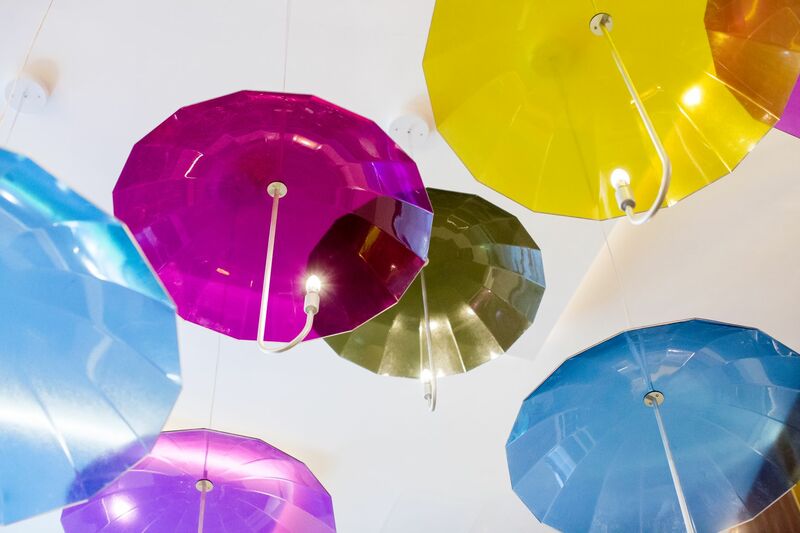 We envisaged the concept and, through talking with our lighting fabricator in Canada, we developed the transparent umbrella installation and the raindrop chandelier. GS: What inspired you to choose the materials and colour scheme? LG: We really took inspiration from the Scottish landscape and all the varying colours and textures that it provides. 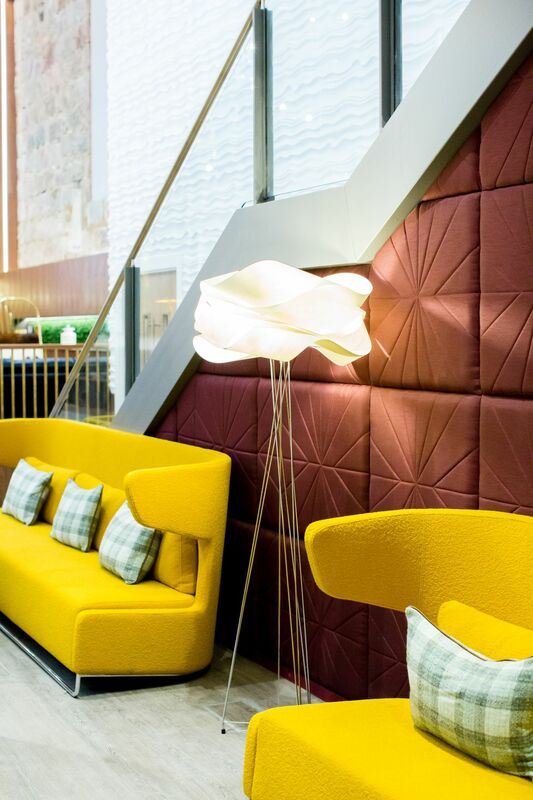 For the lobby the ochre sofas are reminiscent of the vibrant yellow of gorse, the third wall at the stairs is symbolic of waves and then of course there are the ‘cow thrones’ as Aberdeen is well known for its beef. The existing fabric of the building also provided us with some amazing materials in the form of our exposed granite lobby wall and original brick archways, which just add to the grandeur of the lobby. For the guest rooms we really tried to find a balance between contemporary, quirky and cosy. We have used tartan to pull together the splashes of colour in the rooms, along with some unique fun aspects like the antler and cow cushions. GS: Finally, what are you most pleased with? 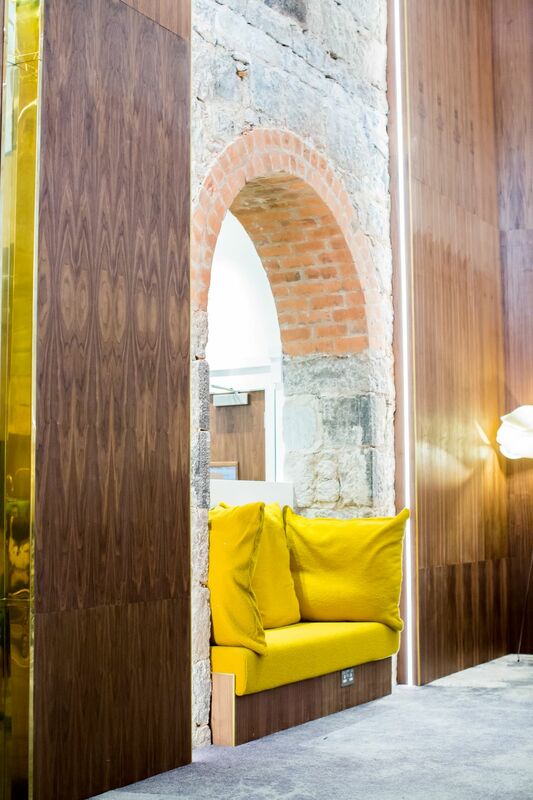 LG: I absolutely love the two ochre upholstered reading niches that are situated within the existing brick and granite arches in the lobby. The combination of the bright fabric against the scale and texture of the granite blockwork, to me, really sums up what I set out to achieve with this design, a bold, exciting and fun interior incorporated into a beautiful old granite building.